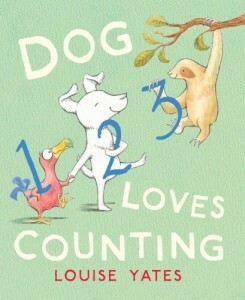 Dog Loves Counting introduces counting up to ten in a very original way. It also introduced us to some interesting new animals – we hadn’t heard of a five-lined skink or a nine-banded armadillo before! The Story: Dog loves books so much that he reads late into the night but then has trouble getting to sleep. Counting sheep doesn’t work so he opens a book that will help him to count other animals. A counting adventure follows during which a camel suggests that they make their way to the desert. Each animal joins them as they count body parts and stripes, when they get to the desert they count the stars in the night sky. My daughter laughs out loud when the five-lined skink appears, she likes the sound of the word and we found a picture of a real skink to look at. She also finds the spider funny, not only does he have eight legs but eight eyes as well. The first animal that Dog meets is a dodo so we also talked about animals that are extinct and how we can help conserve endangered species. The introduction of unusual animals makes the story original and interesting and provided us with stimulus for discussion about non familiar animals. Numbers are shown with each animal so the story introduces / consolidates number recognition and at the end counting backwards is also introduced. I love the way that the illustrations show the animals bonding as a team, the bigger ones carry the smaller ones. We especially like the web that the spider weaves between the armadillo’s ears as he is being carried. The text is easy to read, some of the sentences rhyme and conversation moves the story along to enable the animals to find the next number. 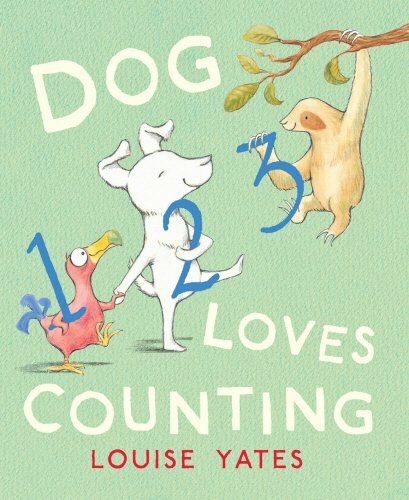 Dog Loves Counting would be a great book to use in the classroom both to introduce and consolidate number recognition but also as part of a topic on animals. The children could choose their own animals and rewrite their own counting story. Maths sheets based on the story could also be made, e.g how many legs do three camels have when you add them together? A very original counting book that introduces new vocabulary and stimulates discussion. I like the fact that not only are children learning / consolidating their number skills but they are also being introduced to new vocabulary and animals at the same time.